Monica Melissa Patterson listens to potential jury comments as she sits next to attorney Fernando Mancias during jury selection at the Hidalgo Courthouse Wednesday, Sept. 20, 2017, in Edinburg. EDINBURG — By the end of his two hours on the witness stand, a terminally ill Rev. Max Grubb was visibly frustrated after being repeatedly questioned by both the prosecution and defense teams. Still, testifying in Monica Melissa Patterson’s capital murder trial was high on the list of things he wanted to do before his death. It was for this reason that prosecutors Joseph Orendain and Cregg Thompson summoned the pastor of McAllen’s First Christian Church (Disciples of Christ) to the stand Tuesday, the second day of a trial that is expected to last at least three weeks. Grubb, who preached his final sermon Sunday, told the courtroom that he could enter hospice care as early as next week, and over the course of nearly two hours, answered questions about his relationship with his former parishioner Martin Knell Sr., 96, the man Patterson is accused of murdering in order to acquire his estate. “I felt like Melissa manipulated (Knell) to take his money from him,” Grubb said, explaining that he only notified Knell’s family of this concern after Knell’s January 2015 death due to clergy-penitent privilege. He said he advised Knell to seek the help of a lawyer after Knell approached him for financial advice, and alleged that Patterson, 50, encouraged Knell to believe that his son was after his money. Omar Guevara, the former board president of Comfort House — the McAllen hospice center where Patterson served as executive administrator at the time of Knell’s death — also returned to the stand Tuesday for nearly three hours. He testified about her alleged theft of the nonprofit’s funds, another charge she faces. Guevara told the jury that Patterson accrued approximately $86,600 in debit card charges and checks for unauthorized expenses that did not relate to Comfort House throughout the course of 2014 and 2015, an amount Salinas told District Judge Noe Gonzalez the defense disputes. The expenses included meals, rental car fees, hotel stays, limo service and flights to Las Vegas. “It gave us a black eye in the community and we were in an ugly financial situation,” he said of the alleged theft. Salinas countered that Patterson made the expenses in her effort to raise the nonprofit’s visibility in the community and secure donations. 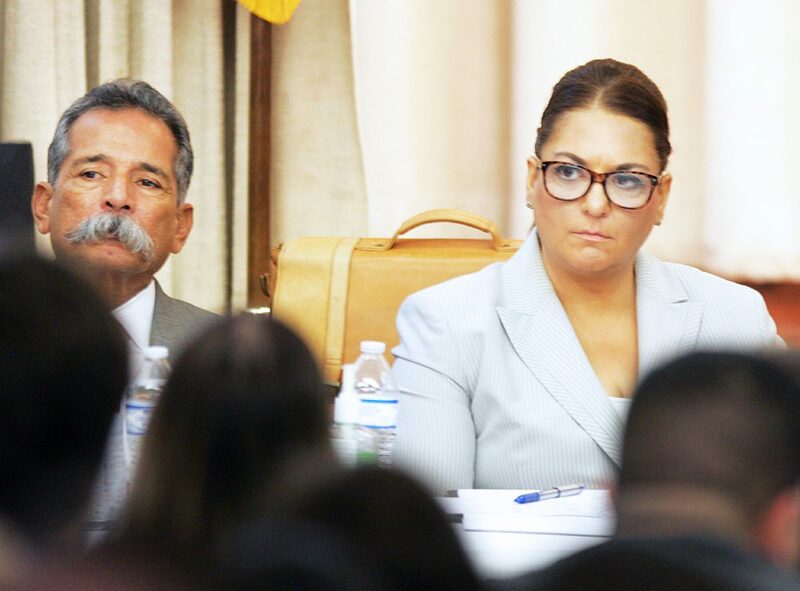 “You made a judgment call on something you felt was allowed and not allowed,” Salinas said to Guevara, pointing out that Patterson’s contract did not detail “what can and can’t be spent.” He also questioned why Guevara never verified any of the transactions with the businesses he deemed unrelated to her responsibilities as administrator. During his testimony, the jury learned that Patterson came to a civil non-disclosure agreement – that was with the board following her arrest and termination in which she agreed to pay Comfort House back $70,000. Salinas argued that because the agreement settled any dispute about stolen items, Texas Rangers mistakenly arrested Patterson on the theft charge because Guevara failed to alert them to the existence of this document. The trial will continue Wednesday with additional witness testimony from the prosecution.